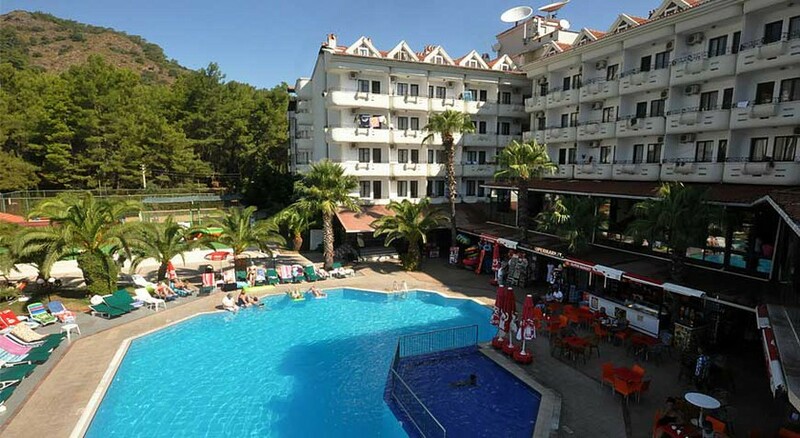 The Pineta Club Hotel is 4-star luxury hotel in Marmaris, Turkey. The hotel is located just 300m away from the local beach. The hotel houses 5 pools, including outdoor, indoor and children’s pool. The hotel has an all-inclusive police to make the guests’ stay a comfortable experience. There are over 500 tastefully-designed rooms. The hotel also has a bar and restaurant on its premises that serves a varied range of delicacies from Turkish and other international cuisines along with local alcoholic beverages. The proximity of the hotel to the beach and the town makes it for a perfect destination for vacationers looking to have a sunny holiday and explore the culture and heritage of Turkey. 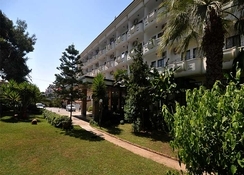 The Pineta Club Hotel is located 98.5km away from the Dalaman Airport. The town of Marmaris is 3.2km away from the hotel. The closest beach is 300m away. The public bus station is 5km away. Marmaris Beach, Aqua Dream Water Park, Marmaris Dolphinarium-Aquapark and Atlantis Water Park are also at a distance of 2km. For the guests’ local excursions, the hotel can arrange for rental cars on request. The Pineta Club Hotel has 501-tastefully decorated rooms that ensure the guests have a cosy, luxurious stay along with a heavenly vibe of a beach vacation sunny Turkey. The rooms are equipped with all facilities and amenities essential for a comfortable stay the vacationers expect and deserve. The rooms are equipped with air conditioning, minibar, telephone, television, hairdryer, bed linen, bath linen, essential toiletries, etc. The Pineta Club Hotel houses a restaurant that serves breakfast, lunch, dinner and snacks in buffet style. The food served includes dishes from traditional Turkish and international cuisines. The outlet also serves alcohol. The guests can choose the all-inclusive package while bookings. The guests can also visit the Marmaris town, which is nearby, and try local hotels and bars to experience the gastronomical delights. The Pineta Club Hotel houses 5 pools (2 adult pools, 2 children’s pool and an indoor pool) which serve as an excellent recreational aspect of the hotel. The guests can also enjoy sunbathing at the nearby beach. 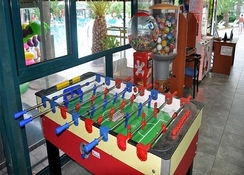 The guests can enjoy sports like football, darts, billiards, tennis, arcade, table tennis, basketball, football and volleyball. 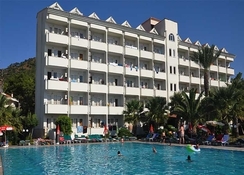 The guests can also hire a car and visit the town of Marmaris for sightseeing. We were originally blocked in to stay in the pineta hotel, but when we arrived it was not open. We went into the pineta deluxe hotel and they had arranged for us to have a room in there due to this. The service was amazing and staff were friendly and helpful. Food was great, and the pools were ideal! We did not try any other facilities but will do when we return. It’s impossible to do the Pineta justice in just a few words. From the pool time surprises to madcap entertainment, this place has it all. Close to all amenities. Great location. Staff were lovely. Hotel is child friendly. Food was okay always a variety. Overall good value for money especially if you go all inclusive. The hotel is basic, carpets thread bare doors are house hold doors that have had years or abuse and the bathroom is speacially designed for petite people. But you get what you pay for ... the food is basic and the drinks are tiny. But it is very cheap to eat out in lovely restaurants (£50 for four adults)a short walk away we spent 3 nights here and only slept in the beds we spent our days in the beach and ate all our meals out! It was bearable for 3 nights (Just ) but it depends on the person you are. The hotel mainly caters to Russians clients. Would I go back ? No, but do I regret going No. I am normally a 5 star snob but was travelling with my uni student sister who would sleep in a box for the right price, it is what you make it and if anything was funny how bad the hotel was. The hotel is average if you want a cheap holiday and plan on eating out most of the time then this hotel is great. if you just want to lay by the pool and chill out in the hotel for the entire holiday probably not the hotel for you. The food was poor and there wasn't much variety, breakfast was the worst, most people didn't eat breakfast at the hotel. Thankfully there are plenty of local bars that sell breakfast,one just at the end of the road. The pool was very cool . It was rather empty as it was cold for most people, but we did visit in October. Selection of alcohol drinks was poor too. They have 1 beer and house vodka and that's about it. So don't go expecting cocktails or a variety of spirits. To be honest you get what you pay for. We went out most mornings and spent a few hours by the pool in the afternoon. Then had dinner and went out again. It was ok for that but I wouldn't want to spend all day everyday at the hotel. When we visited the entertainment had finished for the season but they had weddings on the grounds most evenings so that gave us something to watch. - They were always bizarre and different to traditional English weddings.